In the first two parts of this series1,2, we have attempted to describe and summarize the steps and processes that in the author’s view, provide an almost invariably likely pathway from the production and evolution of various atomic species, formation of huge varying complex chemical mixtures under early earth conditions, and predictable interactions that then could lead to a high probability for the self generation and self-selection of complex dynamic, chemically-reactive systems and processes that ultimately we would come to define as organic-based terrestrial life. This may not be the only such pathway but is argued to be a logical, consistent and realistic one that merits serious consideration. Most would consider the ultimate occurrence of such a completely integrated process as highly unlikely, as one of very low probability. That would be true if the universe only worked with one pair of molecules at a time and in a linear, sequential, trial-and-error fashion. But if these molecular “experiments” occurred in parallel and simultaneously, and in uncountable high numbers of combinations and permutations for such events, as occurs in combinatorial chemistry, but which extended over very long timeframes while under a wide variety of operating conditions, the unlikely could then become the inevitable. This is not unlike the old posit of having an infinite number of monkeys typing on an infinite number of typewriters eventually by random chance and accident being able to create all of Shakespeare’s novels. Up through this point, we have collected a set of basic chemical and physical facts and allowed them to be blended into a plausible story of genesis of the first set of chemical species and energy sources that are thought by many to exist throughout the universe. It provides a certain compelling argument for expecting similar living processes and organisms being likely to have developed throughout the cosmos. But it also provides us with a more specific set of targets and signs to scan and search for other life in our extra-terrestrial explorations now and into the far future. Animacy, one of life’s most useful characteristics when it occurs, is the ability to engage in some kind of movement, relocation or translocation. Such movements are not always present or apparent at the individual organismal level but can usually be found if not individually, then collectively in colony-forming species or multicellular organisms. Even rooted, as well as non-rooted single-celled or colony-forming plants, have the ability to move or reorient themselves in response to their environmental needs (e. g., phototaxis, water seeking tap root growth, gravitaxis, specialized food-trapping structures and flagellated motion). It is hard to overstate how great an evolutionary advantage was gained when living systems of all types finally were able to react to environmental conditions and the presence of other living organisms by development and self-selecting for directed translocation. Motion, reorientation or other movement can be found in different functional modalities in modern day living systems. For instance, the movement of the outer eukaryotic cell membrane as it pinches off at the end of the mitotic cycle performs a different function than the pinching off of membrane vesicles during phago-, endo- and exo-cytosis. Such membrane-based movements are further expanded on with the ruffling leading edge of the plasma membrane in certain types of amoeboid movement. Of course many of these modern day capabilities are also greatly assisted by underlying intracellular structures and molecular processes3 such as microfilament-microtubule interactions4 and the concurrent visco-elasticity changes through reversible cytoplasmic gel-sol modification, the internal relocation of mitochondria and increased rates of intra-cytoplasmic streaming and mixing of chemicals and enzyme complexes (Figure 2). But there has been a well-demonstrated ability by various purified synthetic lipid membrane model systems preparations to also spontaneously possess very similar behavior and capabilities.5 Figure 3 provides a still record of this behavior but microscopic videos have recorded it as a dynamic budding process that is sometimes surprisingly rapid. So the first protocells composed of these chemical compounds simply incorporated the natural tendencies of the self-organized chemicals they were made up of. It was simple, undirected, relatively low-functional movement, but movement and change, nevertheless. And from any kind of change comes the opportunity to evolve into something more adapted to the existing conditions. Thus we likely actually have the initial seed for cellular mobility and animation actually built into the molecular properties of the membrane matrix. It can be enhanced with other underlying molecular machinery, such as microfilament and microtubule structural and dynamically-changing mechanical frameworks, but the primary basics for animacy are built into the physical properties of the lipids, and to a narrower extent, the membrane proteins and carbohydrate-containing molecules that compose such structures in later protocells as well as up through modern cells. For more highly developed mechanisms and structure emerging in cell evolution, such as flagella and cilia, we will have to wait until we discuss the developments after the first prokaryotic and eukaryotic cells transitioned into existence in a later installment. With the intrinsic capability for limited movement already inherent or built-in at the molecular level in protocellular membranes, directed movement could provide a dramatic improvement in survival potential for more successfully composed protocells. For instance, the ability to avoid damaging conditions, such as excessively high or low temperatures (thermotaxis), or seek out better sources of nutrients or avoiding toxic substances (chemotaxis), or find optimal levels of illumination (phototaxis) would be indispensable for enhancing the growth rate, reproduction rate, and survival potential of protocells as it does in modern living cells. In this sense, one might extend the idea of Darwinism and survival-of-the-fittest to the basic animation processes deriving from the molecular properties of various molecules making up the cell membranes. This capability is well-recognized to confer a significant modern advantage to present day life as exemplified in the above figure, but such a capability would have profound advantages to a simpler protocell that was only getting its initial nutrition through soluble compounds. Such dissolved nutrients were rate-limited by slow passive diffusion rates through the surrounding medium. Non-soluble sources of nutrients would have been unavailable to such passive cells. Many things can modify those animation-related properties of modern cell membranes. Such membranes all have a basic common design. The major framework is composed of various phospholipids that preferentially auto-assemble into two-dimensional sheets in aqueous media in the temperature range allowing fluid behavior. One of the most abundant membrane phospholipids, lecithin, is composed of three bonded components. Those are a phosphate moiety, glycerol, and one or two fatty acid molecules (see Figure 5). Figure 5. 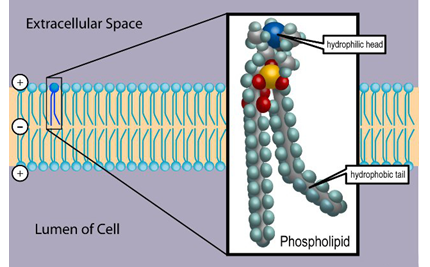 The most common molecule that provides the basic framework for modern day cell membranes is the phospholipid, lecithin. It is made of a phosphate group (blue ball) covalently bonded to a glycerol molecule to which two fatty acid molecules (elongated downward legs) are also attached. This diagram also demonstrates the saturated fatty acid molecule on the left is flexible but can become linear while the fatty acid molecule on the right has a permanent kink in it due to its being unsaturated (that is, containing a double bond between two adjacent carbon atoms in it). Not all phospholipid molecules contain the same fatty acids nor the same proportions of saturated to unsaturated fatty acids. The lengths of the fatty acid chains and the number of unsaturated bonds within the unsaturated fatty acids also modify the temperature at which that part of the membrane transitions between its more fluid to less fluid state, and thus its deformability and fusibility in that same region. (Taken from Wikipedia, “Phospholipids”. Image authored by Ties van Brussel . Accessed 11/30/2015). The elongated phospholipid molecules always have a highly polar end, that is attracted to other polar molecules such as water, and a low- or non-polar end that is not bondable with polar molecules. Those hydrophobic ends tend to become more stably associated with other non-polar molecular regions. When these phospholipid molecules finally finish their segregating and reorientation in a bulk water phase, they initially can form a monomolecular layer at the air-water surface interface, with the polar phosphate ends bonding downwards with water molecules and their non-polar, hydrophobic ends pointing upwards towards the less polar molecules making up air. In this “head down” orientation, the fatty acid hydrophobic tails are stabilized by lower strength van der Waal forces. But that is still sufficient to hold them in a closely packed two dimensional sheet. But in any average suspension of such phospholipids in aqueous media, these monolayers will tend to spontaneously form bilayers in which two monolayers pair up with their hydrophobic fatty acid tails directed inwards towards each other and their more polar, electrically-charged phosphate heads oriented outwards and in intimate contact with the water phase. Water molecules are polar and can hydrogen bond with each other as well as other, more polar molecules. Because of the stronger electrical charge fields existing around the phosphate moiety, water molecules tend to strongly interact with this end of the phospholipids and arrange themselves in a loose cage-like structure surrounding each phosphate group. This overall electrical charge repulsive force and clathrate structure interaction is what generates the natural but slight rigidity in a molecular aggregate that is only two molecules thick! It generates a physical back-resistance to membrane deformation that allows there to be different flexibility between different zones of the membrane. This is energetically a more stable arrangement for a sheet-like structure. In an aqueous phase there are edges where phosphate groups are absent that are exposed to the more polar aqueous environment and those seek to lower their energy state even more by minimizing the exposed internal hydrophobic interior. To minimize this disruption to the water structure surrounding the flat sheet of bilayer membrane, the membrane edges continue the self association process ultimately resulting in an even lower energy arrangement, a closed vesicle shape with no exposed edges. Thus the simplest bilayer membrane geometry that is most stable at normal temperatures is the single bilayer, membrane-enclosed vesicle. Studies have demonstrated that multiple- layered bilayers are also capable of forming. These are not as rapidly permeable as a single bilayer under normal circumstances so it is unlikely that such added barriers between the internal life chemistry and the external medium would confer greater advantages to the newly created protocells. Though we will revisit this thought in a later installment. Analytical and synthetic chemists have a rule of thumb that is based upon this difference in solubility based on the polarity and charges of the molecule’s bonds. Termed the Solubility Rule, it is well known and stated that “like dissolves like”. What this means is that when looking at a molecule’s structure, one can make a fairly accurate prediction of what kinds of solvents would best be useful to dissolve such a compound in. Many kinds of chromatographic and affinity separations of complex mixtures use this relationship as well. It is based upon the thermodynamic properties and bond strengths of intermolecular bonding and rearranging the positioning and orientation of electrically charged and uncharged molecules (or portions thereof) with respect to one another. Its applicability also extends one level further in that when dealing with two or more types of molecules within a single category, such as hydrophobic molecules, that molecules with identical structure tend to further segregate themselves into regions with others of the same structure. Such pooled regions of identical composition in a larger background of molecules of similar low charge and polarities is essentially what is found in modern day biological membrane structure. This has also been termed membrane microenvironments. A good example is the “raft-like” behavior of cholesterol and other steroidal molecules that cluster around embedded and transmembrane proteins within a broader area of bilayer phospholipid membrane (see figure 6). Figure 6. A cross-section of a modern animal cell plasma membrane illustrating the different microenvironment regions of such a membrane. Phospholipid molecules showing the two fatty acid hydrophobic tails (light blue) attached to the hydrophilic heads (darker pink circles) align in two monolayers to form a bilayer framework within which many other molecules associate and function. Region 1 is the microenvironments where no other molecules are present. 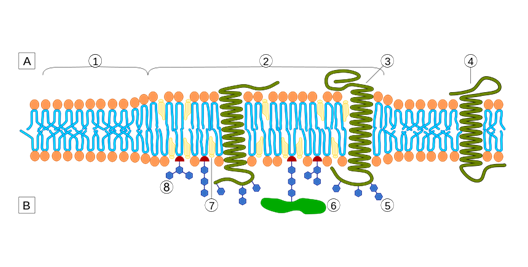 Region 2 is a raft region which is enriched in cholesterol content (number 7 in light pink) and membrane proteins (numbered 3 and 4 in dark green) as well as other kinds of functional molecules (numbered 5, 6 and 8). The raft regions provide a more physically and chemically unique microenvironment within which membrane-bound, multi-protein complexes are attracted and operate. Phase transition temperatures within these regions are expected to be somewhat different than those in region 1 zones. Physical deformability and fusion/membrane coalescence capabilities would also be expected to be modified in those regions as well. (Taken from Wikipedia. “Lipid Raft”. Image authored by Artur Jan Fijałkowski. Accessed 11/30/2015). One purpose of such segregated regions within a phospholipid bilayer is to provide regions of differing solubility for other lower polarity transmembrane molecules, such as transmembrane proteins, to reside in. Such transmembrane molecules can provide specialized transmembrane functions, such as semi-permeability, electrochemical reaction platforms, cell signalling, intracellular communication, and catalysis-assisted processing and transport of specific substances. Obviously, the appearance and conservation of cholesterol-rich, self-associated membranes during protocell evolution would also be a major advantage to increasing the likelihood of more potential functions being able to be added to the developing protocell membrane in our evolutionary story of the perfecting of cells from protocells. Under typical biologically favorable conditions, these phospholipids tend to aggregate together in different packing geometries and with different bonding energies defined, in part, by the kinds of fatty acids that are part of their composition. Regularly-shaped saturated fatty acids tend to “crystallize” into more tightly packed arrangements at some pseudo-solidification temperatures while the presence of unsaturated bonds tends to keep them from crystallizing at those temperatures. What this means is that bilayer membrane lipids will have regions in their 2 dimensional surfaces at any given temperature where the internal, more saturated fatty acids will be more tightly packed and less fluid. Lower fluidity necessarily hinders molecular motions and transmembrane processes while at other, more unsaturated locations those transmembrane processes occur more quickly and with larger scale molecular motions. In such higher fluidity regions of the membrane surface, the packed membrane components can quickly reconfigure to allow surface-localized transport to occur. Other concurrent membrane properties that are affected by the rafting and saturated/unsaturated behavior of the lipid components are membrane flexibility, folding and fusibility/pinch-off potential. Such are the physicochemical foundations for modifying the fluid/semi-fluid/nonfluid behavior potential of all membranes. In studies using modern cell types, the fatty acid compositions of biological membranes actually changes in a single cell type as a function of the growth temperature. This is an active homeostatic control mechanism of cells that is linked to their lipid metabolism. The membrane fatty acid composition is continually readjusted so that the fluid transition temperature is maintained just below the actual growth temperature, assuring transmembrane processing will remain fully functioning. Because these membrane lipids can have several different transition temperatures that can modify both the packing geometries of a single kind of lipid as well as the fluidity and flexibility of that part of the membrane it is found in, membranes are considered liquid crystalline in nature. This provides for thermal transitions between several different phases and thus allows a wide variety of fluidity-based functions to co-exist within a single membrane at the same time at a given temperature. Each transition temperature built into a particular membrane’s lipid framework confers both mechanical and transport limitation ranges as well as the optimum temperatures for each kind of membrane-based process or movement. When one looks at cells that are undergoing some directed dynamic process or behavior, it is tempting to envision that such a large scale movement is caused by or connected to highly localized transmembrane molecular events underlying and inseparably-linked to the overall function being carried out. 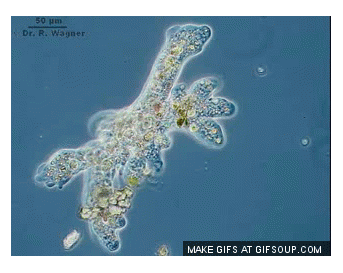 As an example, if one views the formation and extrusion of pseudopodia in a modern day amoeba moving along a surface towards a nutrient-laden particle, it would be greatly aided in its food-seeking chemotaxis if the concentration of soluble nutrient substances diffusing from that particle be the first event that triggers the amoeboid cell movement in that direction. This first event entails recognizing that a source of food is closely present and can be reached by moving in the direction closest to the point on its membrane where the greatest flux of soluble nutrients are passing through. Areas of this closest approach would become enriched in more fluid-like lipids that concurrently would allow a greater degree of deformation at a given temperature while the other parts of the membrane are reduced in their fluidity. They would take on a somewhat more deformation-resistant quality and give the cell a better way of maintaining its directionality of overall translocation or movement. And embedded within the differing functional and structural micro-areas of this food-seeking cell’s membrane are other translocation molecules, like proteins, that are further enhancements to connect the overall membrane alterations with internal biochemical changes needed to capture and process the food source once it is physically encountered. Not only higher fluxes of soluble nutrient molecules would be expected in this initiation of a chemotactic movement, but active triggering of internal cellular motility machinery through localized increases of calcium ion influxes would be coordinated at the same time. Such localized increased calcium concentration just below the deforming membrane surface would also activate microfilament movement creating an internal current of cytoplasmic flow in that same region. That flow would further deform the membrane in that location leading to a general cellular movement in that direction. In protocells, we do not yet have that level of functionality and complexity built in but the co-presence of other lipids with differing transition temperatures and self-association energies can begin to provide such infant cells with a beginning blush of chemotactic potential. Darwinian evolution must then follow to increase rates and improve performance of such a complex set of molecular events found in modern day cells. 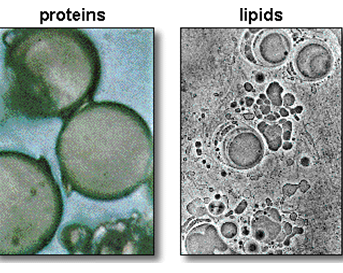 One very basic aspect of cell animacy is likely to have sprung from the molecular structure and properties of the membrane lipids that are to be found in modern cells and likely in early earth protocells as well. 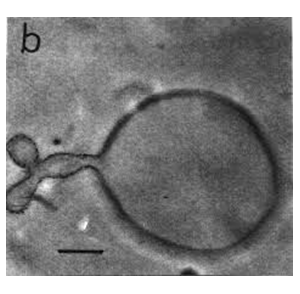 The second action is that of the coalescence and fusion of two or more different vesicles into one larger vesicle, again without loosing or modifying their contents through external medium leakage into them. The fact that such actions are naturally found to occur in most living cells provides us with a directly observable behavior of cells that is based upon the inherent molecular properties of phospholipid membrane composition, internal membrane component rules of association, and the overall tendency to form vesicular structures in aqueous environments. What these two properties allowed the earliest protocells to accomplish was to provide a rather robust and putatively permanent housing for the complex chemical processes that were developing and occurring in the locations on early earth where the building blocks of life were being endlessly and spontaneously generated and modified. These properties of membrane fusion and scission allowed the large pre-protocellular bulk liquid phases containing the various combinations of linked reaction sequences to not only be initially captured, but even more important, to give each micro-collection of complex reactive chemistry the ability to resist dissipation and to remain longer-lasting. It provided the desirable internal environments to maintain the reactants in a more concentrated fashion within small protected environments. With this increased longevity, these reactive vesicles could combine their contents together in a multitude of different trials-and-errors while conserving the higher internal concentrations of ingredients. Such a design would improve the chances for development of even faster and more controlled internal chemical kinetics. But another and even more valuable evolutionary capability was inherent in this protocellular membrane design. The ability to become permanently self-sustaining through the spontaneous scission and generation of vesicular copies of more successful protocell compositions would be drastically improved if the more rapidly growing versions could bud or pinch off into independently growing units. Multiple backup copies of successful versions would be a strategy to conserve a new and more suitable species of protocell. And retaining a smaller vesicular size (i. e., surface-area-to-volume ratio) increases the transmembrane flow of metabolites into and out of the protocells without becoming limited by internal diffusion rates or increased thickness of membrane surface diffusion-limiting solvent boundaries. The forces occurring in natural fluid settings that abound in nature are quite adequate to provide the energy and forces necessary to induce such scissions prior to the evolutionary development of enhanced molecular machinery specifically designed to carry out such gross modern cell membrane modifications as occurs in cell division (Figure 8a and 8b). Figure 8a (top) and 8b (bottom). Simple fluid cascades and waves breaking can provide the shearing forces to stretch and pinch off the membranes of larger vesicles and produce multiple copies of smaller versions of the parent version of vesicles without losing the original content compositions or internal chemistries. It is argued here that these were the first forces available and involved in the earliest versions of protocell formation, division and even subsequent fusions of protocells initially possessing different internal constituents. (Unknown sources). So with this rudimentary mechanism on early earth operating and which caused an increase in protocell numbers, this could be construed as a form of protocell division. It is important to highlight at least one process that would have naturally occurred to show we have a likely physical process for protocell division. Not only would it have been likely to occur anywhere in the world of early earth, it would have sped up the evolution of more successful versions of protocells. Thus it would have increased their survival as well as rates of generation. As long as nutrients are present and waste elimination is not limiting, each separated vesicle of a more successful composition would become another center of growth through mass accumulation. This is a seminal feature of the application of both Chaos Theory and Complexity Theory. This combination of advantages is all proposed to have occurred as a precursor to the development of a genetic code, genomic information recording and directed synthetic management system (DNA, RNA and protein biosynthesis). It provides a plausible mechanism for enhanced multiplying of the more successful combinations of protocellular compositions over those that were less successfully composed in a non-genetic manner through the Butterfly Effect. Self-sealing, membrane-bounded vesicles can also fuse together, safely combining their protected internal contents into new admixtures. This mechanism also provides a higher order potential of developing larger steps in the protocell design changes during the continuous march of trial-and-error experimentation that evolution rests upon. Membrane fusion is also useful for the development of later capabilities of phagocytosis found in many kinds of modern day cells. For instance, a cell engulfs a food particle and takes it into its cytoplasm where that membrane-bounded particle now fuses with lysosomes or other membrane-bounded organelles for further processing. For protocellular survival, the ability to take in non-soluble structures, such as other protocell membrane fragments and less successful protocell versions, and reduce them to soluble nutrients would provide new sources of nutrition. Without that property, insoluble protocell debris would continue to accumulate with no means to rapidly remove it from the niche. This competition could quickly develop into a very early version of survival-of-the-fittest in a predator-prey relationship of protocell types. Modern day cell membranes have many molecular “helpers” to accelerate various membrane-based mechanical movements and modifications. But the intrinsic molecular properties of the phospholipid framework upon which it, as well as protocells, were built was already designed to allow such actions to occur given the right environmental conditions and an adequate, naturally-occurring energy source. The later developments of pino-cytosis, endo-cytosis, exo-cytosis, phago-cytosis and syncytium formation all have highly developed machinery to aid and control these processes. But none would have developed had not the phospholipid component of cell membranes already possessed, in a chemically built-in fashion, its very unique set of associative, disassociative, fusibility and localized variation of permeability properties. And all attendant functions connected to those developments would also have suffered or been unsupportable and lost. Such functions are paramount to the organization and operation in multi-cellular organisms and as such, may be necessary to attain before such larger collective and specialized multicellular organisms could evolve. Animacy is a broad collection of evolutionarily useful potential mechanisms based upon the physicochemistry of protocell membrane lipids. It is an almost incomprehensible testament to the persistence, protection, permanency and survival power of the membrane design that finally occurred in the first successful protocell. That membrane, only two molecules in thickness, had to capture, retain and protect the living chemical processes operating within it in a continuous, never-ending sequence of growth, multiplication and interaction with the outside world for billions of years. It had to have the plasticity to move through even the smallest of passages and instantly seal when any sharp physical insult threatened its integrity. The complex chemistry leading up to the production of membrane-forming molecules is seemingly pre-destined to always form anywhere in our cosmos. What a marvel! © Copyrighted by Joseph H. Guth, 2015. All rights reserved.